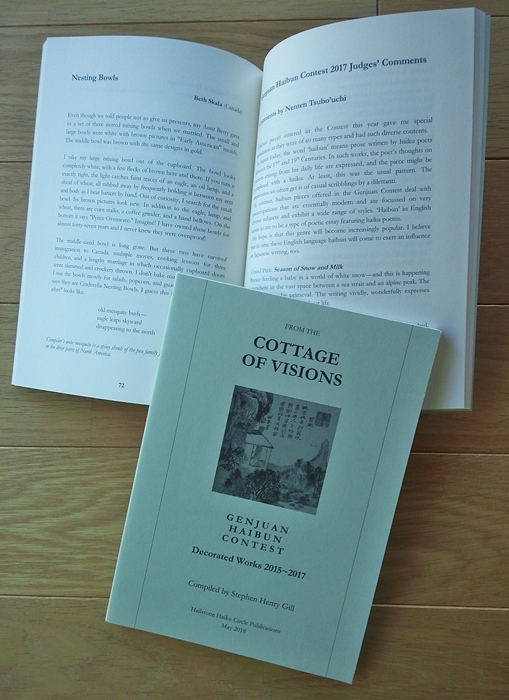 New Genjuan anthology, “From the Cottage of Visions” is out! .. From the Cottage of Visions, a compilation of the awarded works from the Genjuan International Haibun Contest 2015-17, was published at the end of May. 112pp, A5 size, 37 haibun from around the world, some written by Japanese, judges’ comments, a potted history of Japanese haibun, 4 illus. by Buson & Taiga, ￥1,300 (U.S.$13 incl. p&p). .. 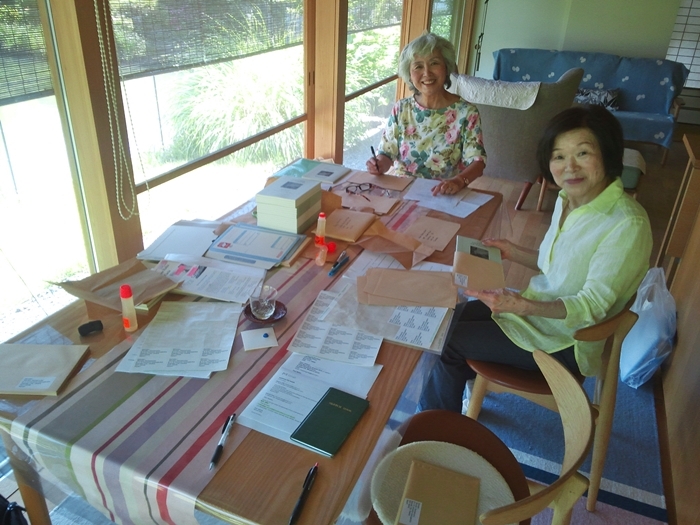 This week, we will honour our commitment to all entrants of the Contest during those three years and airmail more than 100 free copies worldwide (photo shows Officer, Eiko Mori, and assistant, Teruko Yamamoto, doing the addressing!). Entry to our Contest remains free, but we have no wealthy sponsors. So, how have we managed to do this charitable act for all these years? The answer is threefold: some judges have made occasional donations, all labour is done in a spirit of volunteerism, and we have diverted some of the profits made through sales of other Hailstone publications (including Meltdown, Persimmon and our previous Genjuan anthology 2012-14) into covering some of our printing costs. We would certainly like you to buy a copy if you can! The book can be ordered through the channels outlined near the bottom of our Publications page. 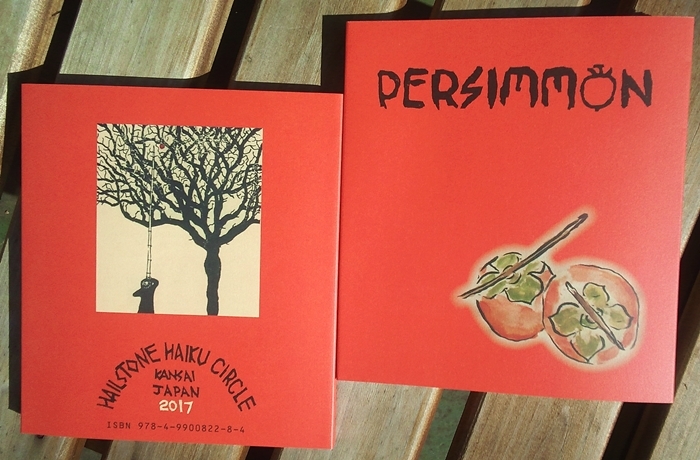 29 Oct. 2017 – in the grip of yet another typhoon, 27 poets gathered at Rakushisha in Western Kyoto to celebrate the launch of our latest anthology, ‘Persimmon’, a collection of haiku by 60 poets, a haibun by Sosui and two rensaku featuring stanzas by multiple authors … and more besides. 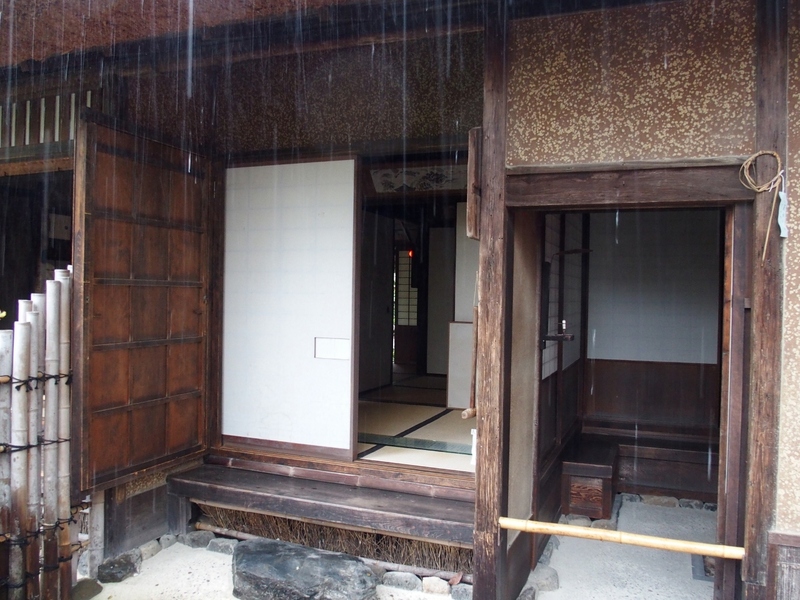 Rakushisha is known in English as ‘the House of Fallen Persimmons’, and its former owner, Basho’s disciple Mukai Kyorai, once ironically referred to himself as a kakinushi, a ‘Master of Persimmons’. 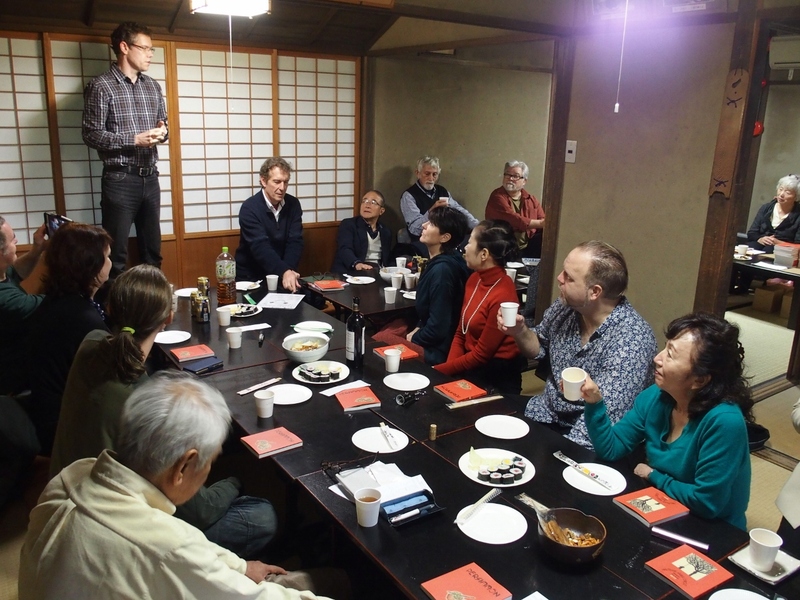 Having stacked our umbrellas and shed our waterproofs and soggy shoes, Richard Donovan welcomed us and proposed the kampai toast. Stephen Gill then explained how the book came about and thanked those who had assisted him with its production and with the happy launch itself. 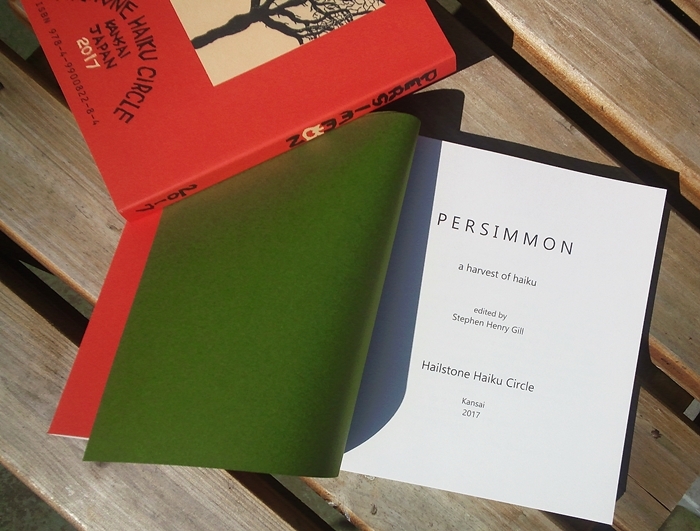 The persimmon is both homely and transporting (柿は心を和むと同時に別世界に連れて行ってくれる), he pointed out. The rain and the wind kindly abated to allow us a much drier journey home, albeit through puddles and under low, black, scudding, twilight clouds. The book has 152 pages and costs ￥1,300 ($12). Details of how to order have been posted on our Publications page. 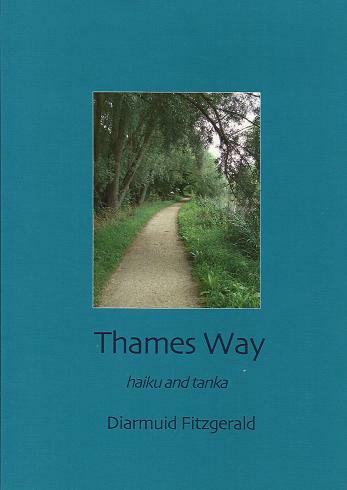 We seldom advertise others’ books on this site, but, given that two Hailstones (NY and SHG) and one recent visitor and Genjuan Haibun Grand Prix-winner (MC) are featured, we thought we would make an exception for ‘Journeys 2015’, which contains no less than 145 haibun, some published for the first time. 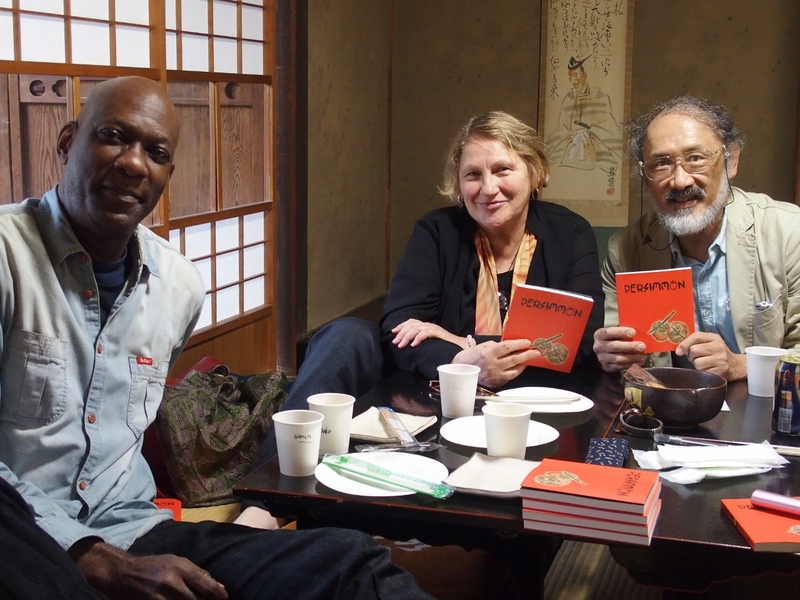 If we look down the list of contributors’ names, we must conclude that this is sure to be an excellent collection of contemporary world haibun and fortifies the mission to make haibun a genre of world literature, one of the twin objectives of the Genjuan Haibun Contest (the other being to re-introduce the genre to its mother nation, Japan). 212 new Buson haiku discovered! Tenri Library (near Nara) announced on 14 Oct. that they had discovered two new books of original haiku by Yosa Buson: one volume of Spring & Summer poems, the other of Autumn & Winter ones. Altogether, they contain just over 1,900 haiku, of which 212 are previously unknown! The name of the missing collection is Yahantei Buson Kushu. 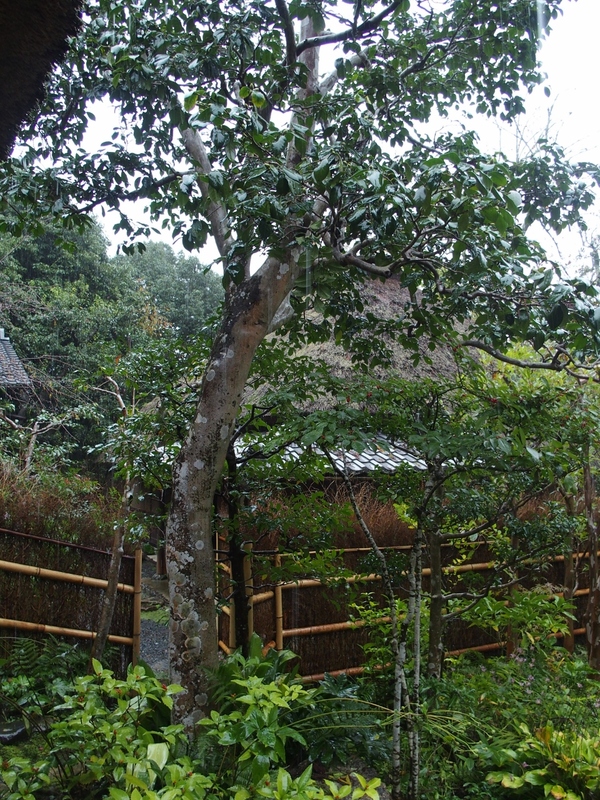 ‘Yahantei’ (Midnight Teahouse) was an alias inherited from his teacher, Hajin, which, later in his life, he used alongside his better-known one of ‘Buson’ (Turnip Village). Above is the first page of the Spring volume, bearing critical marks said to have been made by the poet himself. 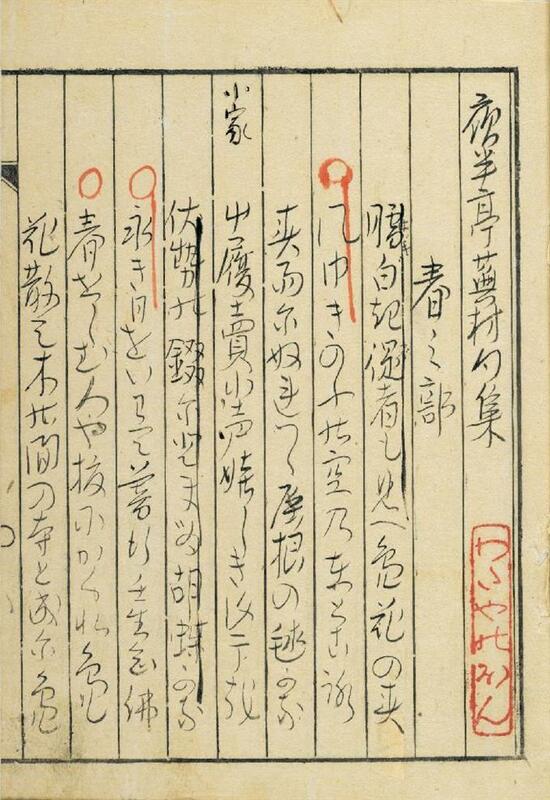 The book was once owned by his Kyoto disciple, Hyakuchi. 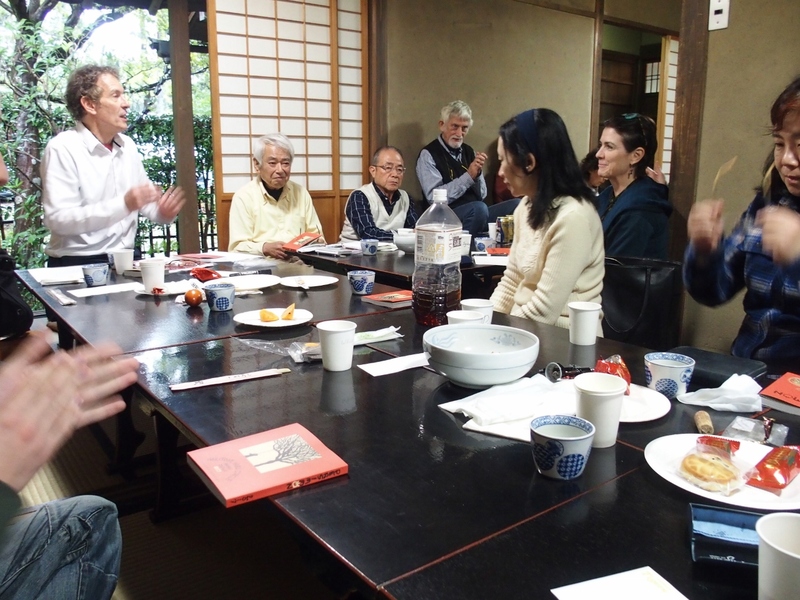 They will go on show at the Library, along with many other Buson-related works, until Nov. 8. Hailstone is planning a trip there on Oct. 25 (Sun.). Free entry. Contact SHG (Tito) for details, or leave a message in the reply/comments box below. To put the find into some sort of context, Stephen was interviewed over the phone by BBC Radio 4 on 16th and you can hear the resultant 3-4 min. passage in the arts programme, ‘Front Line’, (available on the i-player: wait until it has loaded, then fast forward to 17:48′) http://www.bbc.co.uk/programmes/b06gxysv. We are glad to report that “Genjuan Haibun Contest Decorated Works 2012-2014” has just been published. It contains all 29 awarded haibun pieces from these years and follows on the heels of its sister publication, “Kikakuza Haibun Contest Decorated Works 2009-2011”, which was compiled by the same two judges, Nobuyuki Yuasa and Stephen Henry Gill. The works come from many different countries around the world. The book costs ￥1,000 and the p&p charge to be added is likely to be around ￥510 abroad and ￥220 within Japan. 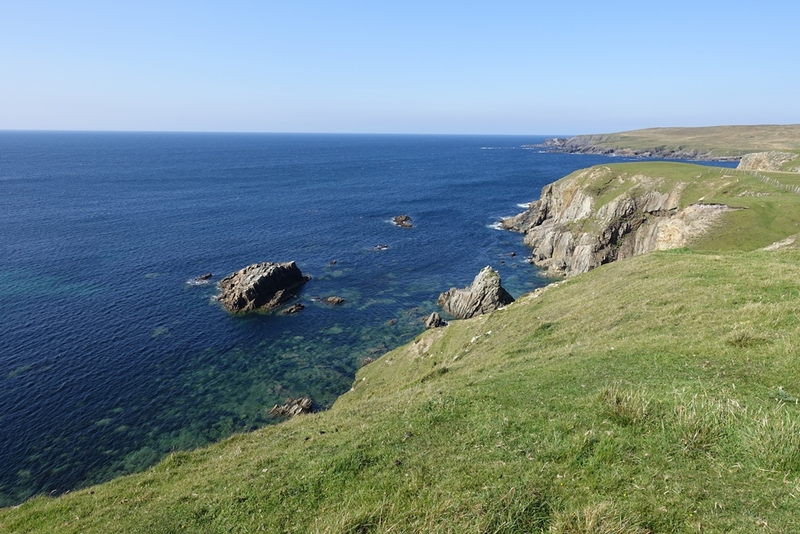 We will decide a round figure and post it onto the Publications page soon (see link at top right of this page). All entrants to the Contest during the years 2012-14 will in due course be sent a complimentary copy! Hopefully this will be done by May. Entry into our Contest has always been free, yet we send out real prizes and certificates to awardees, and we have always felt that we wish to return the support we enjoy from so many poets by also sending out a free copy of our resultant publication. Please be patient as we strive to find the time to perform this task. The book also contains 4 classical haibun (by Basho, Kyorai, Buson, Issa), 3 haibun by the judges, judges’ comments, 13 classical illustrations (by Basho, Taiga, Buson, Goshun), 4 photos of classical haibun sites, and a preface and ‘farewell’ (including some words on the nature of haibun) by Nobuyuki. SHG has added a postscript. This year’s judging has reached its final stage, but the announcement of the 2015 Contest results is likely to take a few more weeks, please note. When ready, it will be made here.